Your life was meant to be a joyous journey. But when negative emotions such as discouragement, stress, loneliness, or grief take over, it can be difficult to put one foot in front of the other. The first step you must take to move past the issues that drag you down is to realize that happiness is not something that just happens to some people and not to others. Happiness is a decision you make. Renowned Christian psychiatrist Dr. Frank Minirth shows you how to make that decision. Drawing from a deep well of experience, clinical practice, and devotional life, Minirth will empower you with many kinds of practical coping strategies. His unique blend of medical, behavioral, and biblical principles will help you overcome your circumstances and achieve lasting happiness. Frank Minirth, MD, is the author of many bestselling books and the coauthor of Happiness Is a Choice. He is president of the Minirth Clinic in Richardson, Texas.Frank Minirth, MD, is president of the Minirth Clinic in Richardson, Texas, and one of only 122 doctors in the U.S. and Canada certified by the prestigious American Society of Clinical Psychopharmacology. He is the bestselling author of Happiness Is a Choice and can be heard weekly on both local and national radio. 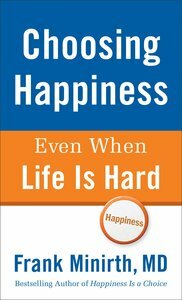 About "Choosing Happiness Even When Life is Hard"
This book offers positive, achievable steps to help readers determine how to move past issues such as discouragement, stress, difficult relationships, aging, loneliness, depression, and grief. Frank Minirth (MD.,Ph.D) is a Christian Psychiatrist and president of the Minirth Clinic in Richardson, Texas, he is one of only 122 doctors in America and Canada certified by the prestigious American Society of Clinic Psychopharmacology. Dr. Minirth has authored or co-authored more than 70 books, many of which have been translated into foreign languages. Best-sellers include Love Hunger, Love Is a Choice,100 Ways to Overcome Depression and the bestselling Happiness Is a Choice and can be heard weekly on both local and national radio.